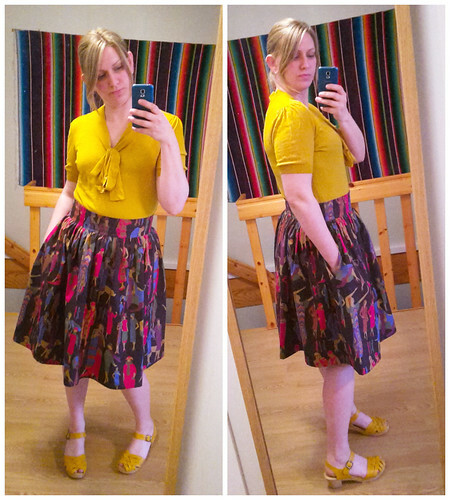 I had a sewing day yesterday and managed to finish my Clémence skirt for the Spring for Cotton sew-along. I wanted to make something that would show off the lovely print and that I would actually wear, I was playing with the idea of making a 20s style dress, but thought it would be too much and the fabric is a little to stiff for that look. I bought the fabric on Ebay back in 2009, I think it was listed as a Liberty fabric, but I’m not sure if it is or not, I’d love to be able to find out, so if anyone knows, please let me know. On other news, I’ve just finished my first week of a 6 week internship with an e-commerce company, (it’s part of my education) it’s a lot of fun, even if I still feel totally lost in the code. This entry was posted in Inspiration, Sew-along, Sewing, Stash Busting. Bookmark the permalink.